After Janet Todd wrote about “English verdure” for Emma in the Snow, I wanted to know more about her new novel A Man of Genius and the connections between her career as a scholar and critic and her career as a fiction writer. Today I’m pleased to share with you the conversation Janet and I had recently about her work. The US launch for A Man of Genius is in New York on Thursday, May 5th at Book Culture (536 West 112th Street). Janet is the author and editor of many books on Jane Austen and other writers, including biographies of women writers from Aphra Behn to Mary Wollstonecraft. She spent her teaching career mainly in the US and the UK and in her retirement she’s focusing on writing fiction. 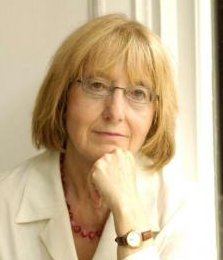 Her last two academic positions were as Professor of English in the University of Aberdeen and President of Lucy Cavendish College, Cambridge. Ann, an author of cheap Gothic novels, becomes obsessed with Robert James, regarded by many, including himself, as a genius; she is captivated by his Romantic ideas, his talk, and his band of male followers. The pair leaves London for occupied Venice, where Ann tries to cope with the monstrous ego of her lover. The relationship grows tortuous as Robert descends into near madness. Forced to flee with a stranger, she delves into her past, to be jolted by a series of revelations—about her lover, her parentage, the stranger and herself. What inspired you to write A Man of Genius? All my life I’ve been inventing stories. From as young as I can remember I wanted to be a writer of some sort, first an epic poet like Milton, then a lyricist in Wordsworthian mode, then later a novelist on the scale of War and Peace. After that came reality and the day job. From time to time I started novels, still where my heart lay, but other duties were always there, always demanding. I never made time to finish and polish the fiction I’d started. And of course it was far easier to write with a firm contract from a university press than to take a leap in the dark by seeking a publisher for a first novel. A Man of Genius touches on many topics that have long concerned me, the power of memory and the confusion of memory—what is one’s own, what the culture’s, what other people’s—and how difficult it is to know the difference between faithful love and addiction to a harmful relationship. I’m always interested in human complexities and eccentricity, and both are, for me, best explored in fiction. You’re the author and editor of several scholarly books. What are some of the connections, and contrasts, between your work as a critic and scholar and your work as a novelist? I arrived in the USA in 1968 after working for some years in Africa. I rather fell into academics. Fortunately it was the beginning of the feminist movement in universities, and there was much to do: much to fight for and much to investigate within the academy, which at that time was patriarchal through and through. So I found that research was perhaps what I wanted to do just then; novel-writing had to be put on hold. I realised how many wonderful women writers were out there in the centuries that most interested me—the late seventeenth to the early nineteenth: “Dryden to Byron” as it was termed then—or, as I increasingly saw it, “Aphra Behn to Mary Shelley.” Women had largely dropped from the canon and were unread. So in the greater intellectual freedom I found in the US compared with Britain, I began teaching and doing research into women writers and in men’s depiction of women. I started the first journal in English devoted to female authors, published a book about women’s relationships, then moved on to large-scale editing projects of important authors, including Jane Austen, and finally to biographies. A Man of Genius is dear to my heart since, although the story and characters are entirely fictional, its background and setting relate to the period and writers I have been studying and teaching. And the central relationship between a male “genius” and a female hack writer, although, as I repeat, entirely fictional, draws a little on the fraught relationships I have described in my biographies. For instance, Death and the Maidens portrays the effect of a real and haunted “genius,” Percy Bysshe Shelley, on Fanny, eldest daughter of the great feminist writer Mary Wollstonecraft, as well as on her half sister Mary Shelley and on his first wife Harriet. In A Man of Genius I ask what occurs when the assumed genius begins to doubt his superior powers and when his lover fears her idol may have clay feet. I wanted to investigate not simply a relationship where one person abuses another but also where both feel for a time exhilarated, then are both simultaneously damaged. I also wanted to portray a woman whose head is filled with stories, a woman who never plays safe, who makes mistakes, but who has the resilience always to go on and try again. You describe A Man of Genius as your “first original novel”—how is it different from Lady Susan Plays the Game, which you published in 2013? Lady Susan Plays the Game was a spin off from Jane Austen. As you know, there’s an enormous industry of Austen prequels, sequels, retellings, transformations, mashup etc. I wrote about some of these for my edited Cambridge Introduction to Pride and Prejudice. Although “Lady Susan” has come into the public arena with the recent film, it was little known among general readers, even those who much admired Jane Austen. It’s a skilful work, like everything Austen penned, but it’s in letters and can only do certain things. It gives voice to the letter writers but doesn’t describe the inner life of other characters. So I thought I would—primarily for enjoyment—take the skeleton of the tale and flesh it out, and also give a back story to the rather hapless daughter. In short, the plot and characters are Jane Austen’s, but I added some sexual shenanigans and new voices, while suggesting reasons for Lady Susan’s character and debts. However I didn’t deviate from the plot Jane Austen created. A Man of Genius is entirely my own imaginative work, so is very different. It’s also much darker, more Gothic. It’s set in the Regency period, now so associated with Jane Austen, but it upfronts the more violent, oppressive side of this troubled post-war time. It’s a world of the working middle class in London, not of the rural gentry. I then take my characters outside England to Venice for a large part of the story, a Venice that fascinates then as now, but which never gives up all its secrets. In this watery city my characters find much about themselves, feel the allure of the magical place, but never quite get to the source of the mysteries that surround them. What’s some of the best advice you’ve received about writing, for fiction or non-fiction (or both)? I was an only child and we moved often, so as a young girl I had very little chance of mentors—I changed school on 13 occasions and in different countries! As I said, I’ve been writing most of my life. I don’t find writing therapeutic in the sense of being confessional and cathartic. I just find it all-consuming, pleasant when life is going well and hugely useful when it’s not! The only direct advice I have had about fiction-writing has come from two crime writers I met recently while president of Lucy Cavendish College: P.D. James, now sadly no longer with us—though her wonderful novels are still much read—and Sophie Hannah. Phyllis said that you should have a body in the first chapter and Sophie told me to grab the reader on the first page. Both good ideas. The Romantic poets declared they wrote from sudden inspiration, though there’s proof that they often corrected. Jane Austen was honest about her revising: she honed Pride and Prejudice over fifteen years and corrected her later novels as well, as you can see from the cancelled pages of Persuasion. For me revising is of the essence—and something I greatly enjoy. I recommend it. Now I think of it, I suspect that Jane Austen herself indirectly gave me as good advice as any. She told her novel-writing niece to convey her sense “in fewer words,” get details of time and place correct, and realise that what might be true in life doesn’t necessarily work in fiction. Finally, if you don’t know what happens in Ireland, keep your characters in England! Janet has kindly agreed to answer further questions, so please do comment here if you’d like to ask her about her work. I enjoyed Lady Susan Plays the Game and I’m looking forward to reading A Man of Genius. Thanks very much, Janet, for visiting the blog today—and congratulations on what sounds like a fascinating novel!